Tulsi, or Holy Basil, is worshipped in Hinduism and is a plant associated with Lord Vishnu and Lord Krishna. There are several stories in the Puranas that explain the significance of Tulsi plant and also there are several episodes in the life of Krishna which is associated with the Tulsi plant. This story of Tulsi and Lord Krishna explains how Tulsi Plant attained the sacred status it is enjoyed today. Please note that there are several such stories in the Puranas and this is one of them. Satyabhama one of the queens of Lord Krishna was proud of her beauty and always thought that Lord Krishna loved her most. Sage Narada who came to know about this wrong notion of Satyabhama decided to trick her. He arrived at her residence and was traditionally welcomed by Satyabhama. Pleased with her hospitality, Sage Narada asked Satyabhama to ask a boon. She wanted the blessing from Sage Narada that Lord Krishna will be her husband in all her births. Sage Narada then said that it is a well known fact that one who donates the choicest article in this birth will get it back in the next birth. So she can now donate Lord Krishna to him to get it back in the next birth. 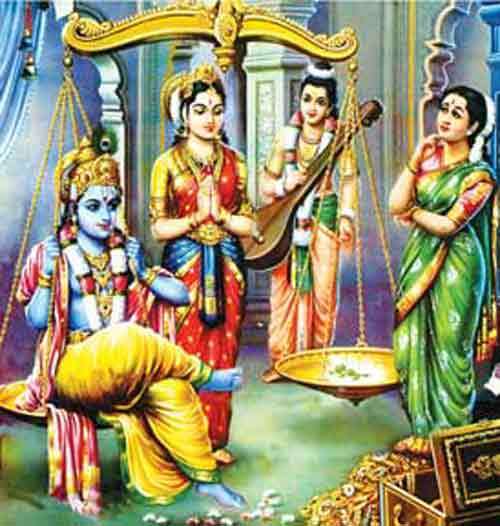 Without much thought, Satyabhama agreed to donate Lord Krishna to Sage Narada. Soon Sage Narada approached Lord Krishna and asked him to accompany him as he was donated to him by Satyabhama. The news of Satyabhama donating Lord Krishna to Sage Narada spread like wildfire and the other queens of Lord Krishna arrived on the scene. They surrounded Lord Krishna and said that they had equal right over him and Satyabhama cannot donate him. The queens pleaded to sage Narada that they were ready to give anything in exchange of Lord Krishna. Sage Narada agreed to take equal amount of gold, precious stones and gold to the weight of Lord Krishna instead of the Lord Himself. The queens agreed. They brought all their valuables and placed it on a weighing scale and Lord Krishna sat on the other side of the scale. But scale did not move a fraction. 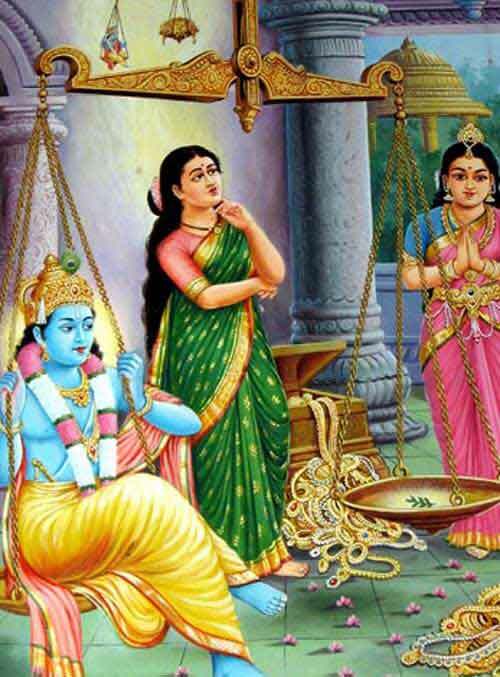 Satyabhama then realized her folly and now desperately wanted to get back Lord Krishna. She said to the other queens that Lord Krishna loves me the most as I am the most beautiful and wealthy and the scale will only move when I donate my ornaments. So she went to the weighing scale and placed all her ornaments. But the scale did not move a fraction. All her pride went to dust. A disappointed Satyabhama went Queen Renuka who was worshipping the Tulsi Plant. Upon hear the story, Queen Renuka plucked a Tulsi leaf and gave to Satyabhama and asked to remove all the ornaments and place the Tulsi leaf on the weighing scale. A surprised Satyabhama did as directed by queen Renuka. Suddenly the scale moved and balance was struck. Sage Narada happily took the Tulsi leaf and left the scene. A relieved Satyabhama and other queens went to Queen Renuka and joined in the worship of Tulsi. Queen Renuka told them that Lord Krishna cannot be moved by wealth or beauty but only by pure devotion. And Tulsi plant is one of his greatest devotees. People began to worship Tulsi from the day and it attained sacred status.